A woman has been jailed for killing a man she met on the day she appeared in court for punching a police officer who tried to stop her running on to the M6. 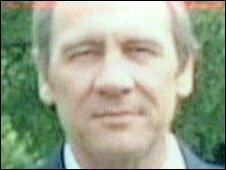 Sabina Eriksson, 41, admitted the manslaughter of Glenn Hollinshead in Stoke-on-Trent on 20 May 2008 on the grounds of diminished responsibility. 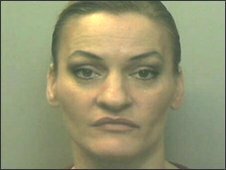 She was sentenced to five years at Luton Crown Court on Thursday. Swedish national Eriksson, of County Cork, in the Irish Republic, admitted the offence at an earlier hearing. The court heard that Eriksson had a rare psychiatric disorder which made her hear voices, but she could not interpret what they said. Eriksson, of Mallow, befriended Mr Hollinshead when he was walking home from a pub on 29 May 2008. Earlier that day, she had appeared before Fenton Magistrates' Court charged with punching a policewoman who had tried to stop her from running across the M6. That incident had happened near Keele services, in Staffordshire, on 17 May 2008. It was recorded on camera by a film crew from the BBC TV show Traffic Cops. Magistrates in Fenton had sentenced Eriksson to one day in prison for the assault on the police officer, but she was immediately released because of the time she had already spent in custody. The court was told how Mr Hollinshead took pity on Eriksson and invited her to stay at his house as she had nowhere else to sleep. However, in the morning she stabbed him four times with a kitchen knife, killing him. She was later seen by witnesses with a hammer, using it to hit herself on the head, before jumping 40ft (12.2m) from a bridge on to the A50 in Stoke-on-Trent. The incident on the M6 happened when Eriksson and her twin sister Ursula were travelling on a National Express coach from Liverpool to London, the day after they had left their home in Ireland. The coach stopped at the service station to change drivers and the two sisters disembarked and ran on to the motorway's carriageway. Eriksson, who was wearing a red coat, was knocked into the air by a car and lost consciousness for a few minutes. When she woke up, she got up to run across the carriageway again. A female police officer tried to stop her but Eriksson punched her. After running across the opposite carriageway, Eriksson was then restrained by police. Judge Mr Justice Saunders said Eriksson's culpability for her actions was "low" on the basis of the medical evidence. He said: "I understand that this sentence will seem entirely inadequate to the relatives of the deceased. "However, I have sentenced on the basis that the reason for the killing was the mental illness and therefore the culpability of the defendant is low and therefore the sentence I have passed is designed to protect the public. "It is not designed to reflect the grief the relatives have suffered or to measure the value of Mr Hollinshead's life. "No sentence that I could pass could do that. It is a sentence which I hope fairly measures a truly tragic event." I see there is no mention of our lads who were first on scene and attempted to stop the twins from endangering other road users! Maybe not, but at least she's behind bars for now! slabber wrote: I see there is no mention of our lads who were first on scene and attempted to stop the twins from endangering other road users! Why were they called then? What i dont understand is that the older HATO says that he and I quote "I suspected they were both going to do a runner". So why were all 3 lanes re-opened so quickly and why werent the twins "restrained" abit more?? Especially the 2nd after the 1st one did a runner? Was it not the male police officer and then the female officer who chased her and "re-caught" her on the other carriageway?? First things first. We are not authorised to restrain people, our remit is traffic management, and if a psycho swedish twin wants to lamp someone, why not a highly paid RPU officer. I dont get paid enough to get my handsome features rearranged! TangoOscar31 wrote: Ofcourse they did? The question isn't "why were they called then? ", the question should be, "why weren't they called first?" Pedestrians running across the carriageway and down the central res isn't a HA remit job. "re-caught" - i thought they were dancing? slabber wrote: First things first. We are not authorised to restrain people, our remit is traffic management, and if a psycho swedish twin wants to lamp someone, why not a highly paid RPU officer. I dont get paid enough to get my handsome features rearranged! Highly paid RPU officer - whats one of those?? Ofcourse Im jesting. I love seeing HATO's squirming in their chairs! Maybe they were called first, but as you HATO's always say, trafpol were probably sat in a HATO lunch hotspot having a brew and pie's? Thats because the government employed monkeys, I mean HATO's to deal with this stuff. To free up trafpol time for proper crimes! I suppose it's better than D&G employing ex cabbage heads!! TO31 works for Dolce & Gabbana??????????????? Is he the fashion police?? Wrist Assessment wrote: TO31 works for Dolce & Gabbana??????????????? Is he the fashion police?? Nah, he just thinks he's a prima donna!! I hope once her prison sentence has finished she will be carted off to the funny farm. Utter Nutter!